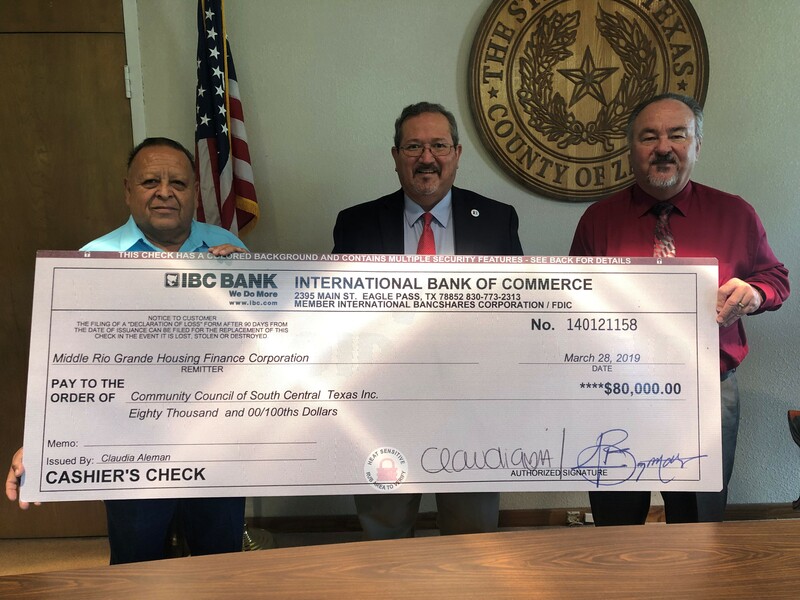 On Thursday April 4, 2019, the Community Council of South Central Texas, Inc. (CCSCT), received $80,000 from the Middle Rio Grande Housing Finance Corporation. The funds are designated for Zavala County low-income residents who are in need of home rehab services. CCSCT is a non-profit, 501©3 organization whose mission is to empower vulnerable families and individuals in greater South Central Texas to achieve self-sufficiency by eliminating barriers through innovative programs and strong community partnerships. Among other programs, CCSCT currently provides services through the federal Weatherization Assistance Program in Zavala County, to assist low-income families in making their home more energy efficient. In many cases the general condition of a home prevents CCSCT from initiating the services made possible through the Weatherization Assistance Program. These homes may be in need of extensive roof repair or replacement, electrical wiring, safe entry or exit from the home and other health and safety issues. The housing rehab funds will make these types of repairs possible. CCSCT would like to thank, Zavala County Commissioner and CCSCT Board Member, Commissioner Miquel Acosta for his effort in making this very generous contribution possible. For more information on the federal Weatherization Assistance Program and other services provided by CCSCT in Zavala County, please visit our website at www.ccsct.org. You may also call CCSCT’s Uvalde Weatherization Assistance Program Office at 830-261-5514 or Zavalla County Community Services Office at 830-854-2110.